FEELING UNFOCUSED? YOU NEED NOT BE FLUMMOXED, SAYS SCIENCE. Are your mental meanderings a must-have feature of your cranial life or a bug in your skull system? 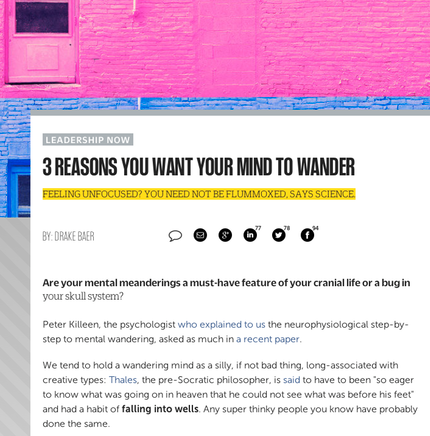 Peter Killeen, the psychologist who explained to us the neurophysiological step-by-step to mental wandering, asked as much in a recent paper. We tend to hold a wandering mind as a silly, if not bad thing, long-associated with creative types: Thales, the pre-Socratic philosopher, is said to have to been "so eager to know what was going on in heaven that he could not see what was before his feet" and had a habit of falling into wells. Any super thinky people you know have probably done the same.